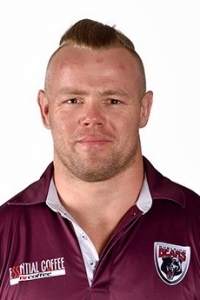 KUMUL prop Luke Page is part of a Burleigh Bears side who face the PNG Hunters in Sunday’s round 18 Q-Cup fixture at the National Football Stadium. Despite being named on the bench by coach Jim Lenihan, the 26-year-old, who has played three tests for Papua New Guinea, will be keen to remind Hunters mentor and Kumuls coach Michael Marum, he is up for World Cup duties despite his side’s poor form in 2017. “He gives the Bears a lot of go-forward and aggression,” Marum said of Page. Marum said he had been keeping tabs on Page’s form through his weekly stats and would speak to him when he gets in tomorrow. The hard-running front-rower would also been keen to help his side avenge their 42-6 loss to the Hunters at Pizzey Park in round 8. Page’s form for the Bears has been solid in a difficult season for the defending premiers but he showed in the May test against the Cook Islands his quality as a reliable metre-gainer and punishing defender. Against the Hunters, Page would relish facing his Kumul teammates and test himself against the Q-Cup leaders on their home turf. For the home side, the absence of three-quarter Adex Wera means the Bears can rest a little easier after the Simbu man terrorized their left edge crossing for four tries the last time they met. The straight-running Wawa Paul stands in for the injured Wera and will pose a different challenge to the visitors’ defence, namely that he knows only one way to play – straight and hard. Coach Marum said his side’s focus was on the 11th-placed Bears even though they are a shadow of the 2016 title-winning team. “We need to concentrate on our preparation but we’re not going to be taking the Bears lightly no matter what position they’re on the table,” Marum said. With seven games (plus a bye and three home fixtures) left in the regular season the Hunters look set to achieve their season’s goal of finishing in the top six and despite leading the competition Marum was not buying into the idea that their finals spot was already sewn up. Among changes for the home side, Stargroth Amean returns to his preferred fullback position with Bland Abavu returning to the wing while back-rower Nixon Put drops back to the bench to make way for veteran David Loko, who performed strongly off the bench last week. Vice-captain Wellington Albert returns to the front-row replacing youngster Muka Peter Kulu. Hunters: 1. Stargroth Amean 2. Bland Abavu 3. Israel Eliab 4. Willie Minoga 5. Paul Wawa 6. Ase Boas (C) 7. Watson Boas 8. Wellington Albert (VC) 9. Wartovo Puara Jr 10. Esau Siune 11. David Loko 12. Rhadley Brawa 13.Brandy Peter; Reserves: 14. Sailas Gahuna 15. Stanton Albert 16. Nixon Put 17. Butler Morris 18. Moses Meninga 19. Karo Kauna Jr 20. Adex Wera.